Ok, everyone. I keep it short, as work is taking me down this week. 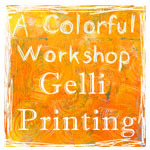 But I had time to play at Carolyn’s Gelli Print Party.. now every first Friday of the month.. Won’t you join us. 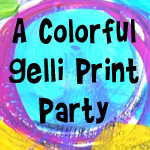 Check out her blog and all the linkys to the party. I enjoyed some of the prints.. not all, but was still quite fun. 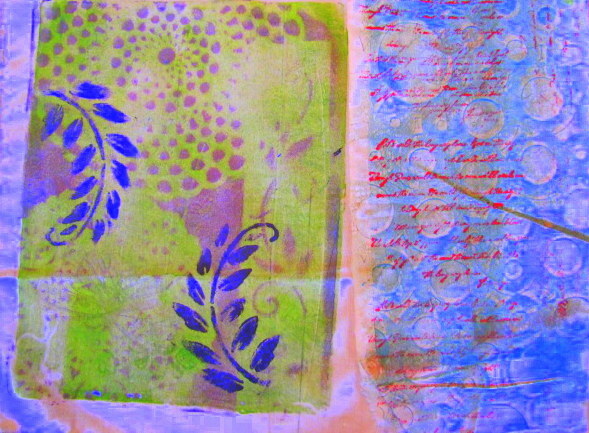 I imagine building even more layers of stamps and image transfers. Endless, I tell you.. endless. 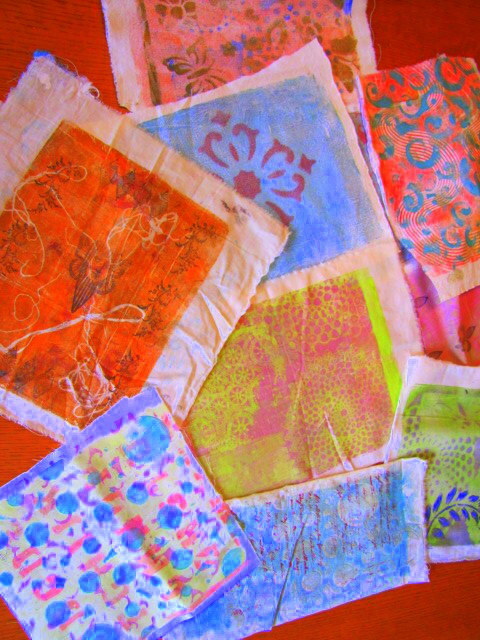 Here are some close ups of the fabric prints. 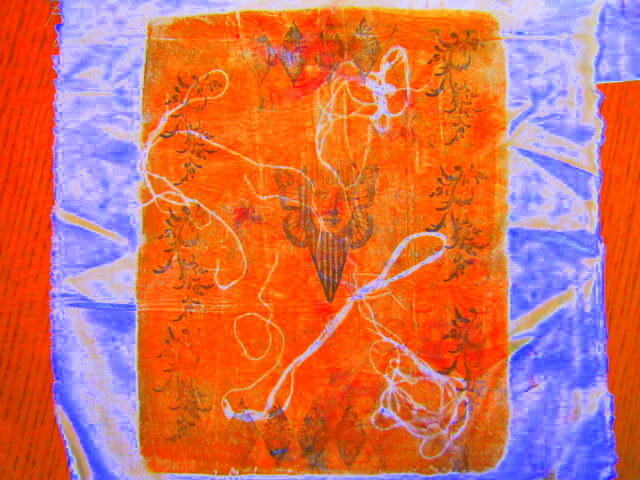 I increased the saturation, as the paint on the fabric is very suttle and the camera did not justify the colors. Thanks for stopping by. Share the love. 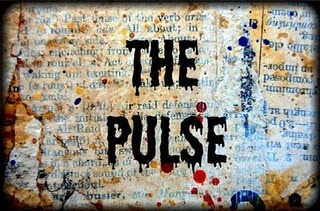 I know, I know.. 3 posts in one week… what’s going on? Hey, have to keep you on your toes. 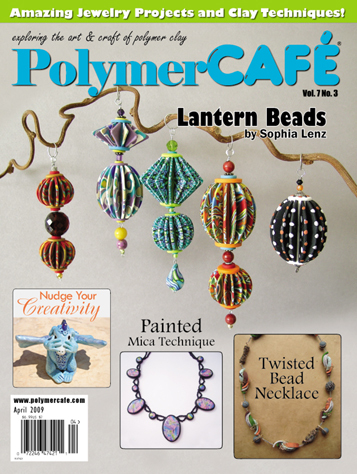 I walk in my the studio to clean up a little or to put away a previous project’s stuff still hanging around. 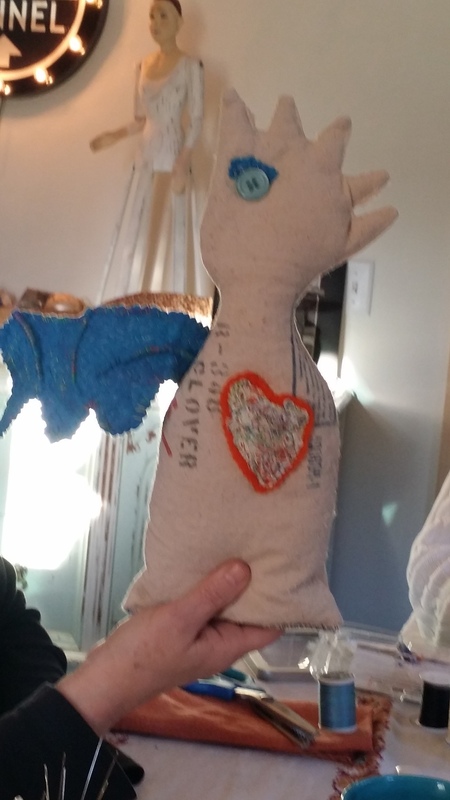 As you know, I”ve been cleaning out the room of old stuff no longer needed. 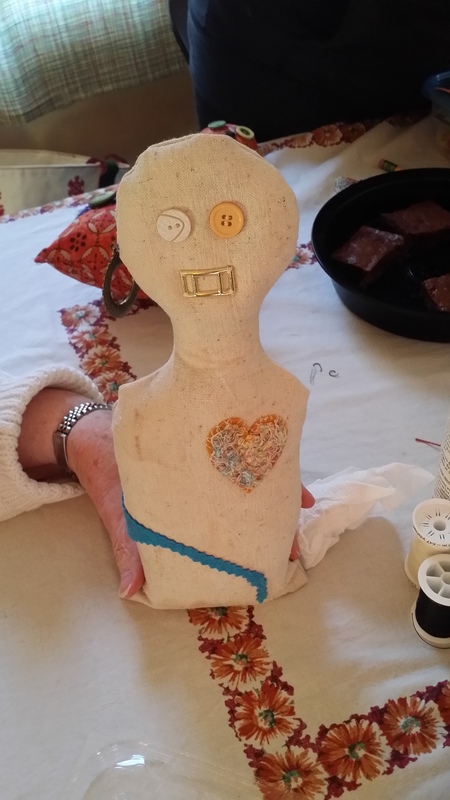 I had dried up paints in jars, clogged up spray bottles and rock hard polymer clay (that I wasn’t about to bring back to life with a food processor). Anyway………. ….. 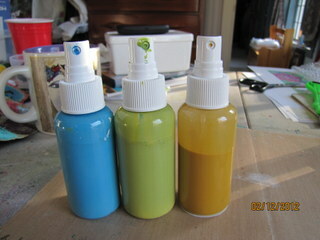 I look at some of the new Dylusions Spray Inks (by Ranger/Dyan Reaveley) I just splurged on. Hmmm.. let me give them a try on a piece of 11×14 Bristol paper. Spray..ooooo… spray…ooooo.. another spray… ohhhhh. These colors are delicious, let me just tell you right now. 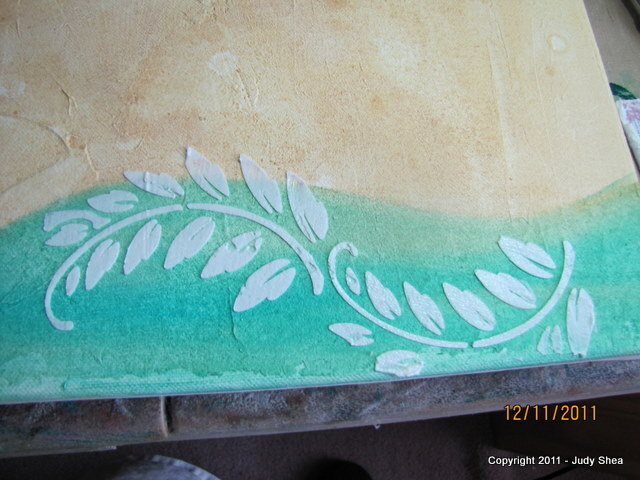 Tulip Dimensional paint – for the white little dots and spiral flower on bottom right. Now, mind you, this is done over a few days and in between cleaning. See, I just sit down and I end up making something with no plans. I wish I had taken pictures of this from the beginning, but I had no idea, I was going to keep going.. After all, I was just playing with ink. Here is a picture of my final page…. See the little pansies at the top left corner and on the right, 1/4 of the way down? That was some sheer fabric that one of my subscribers sent me. 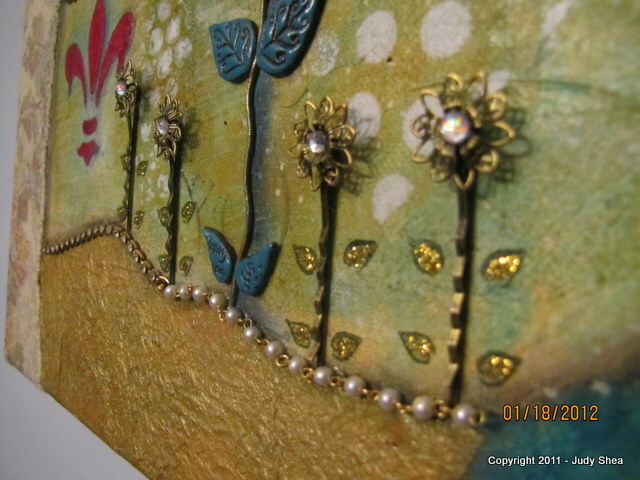 I cut around the flowers and slapped those babies down with some gel medium. The melted right into the background. 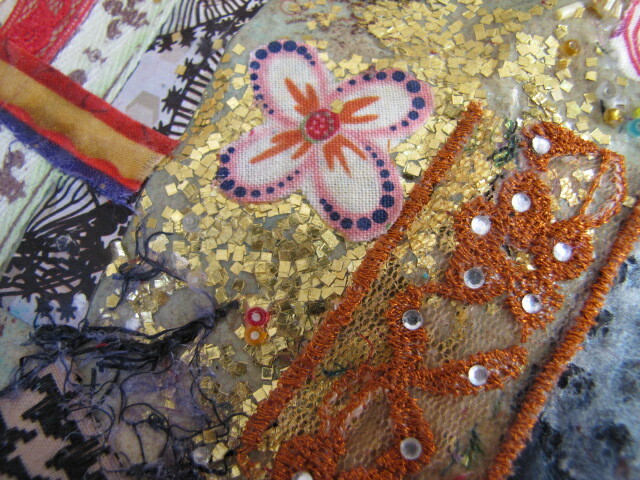 Nancy sent me a package full of music papers, old books, fabric, decorated wall paper (I think that’s what it was) and some old jewelry and some other goodies. So generous, that someone would think of me like that. 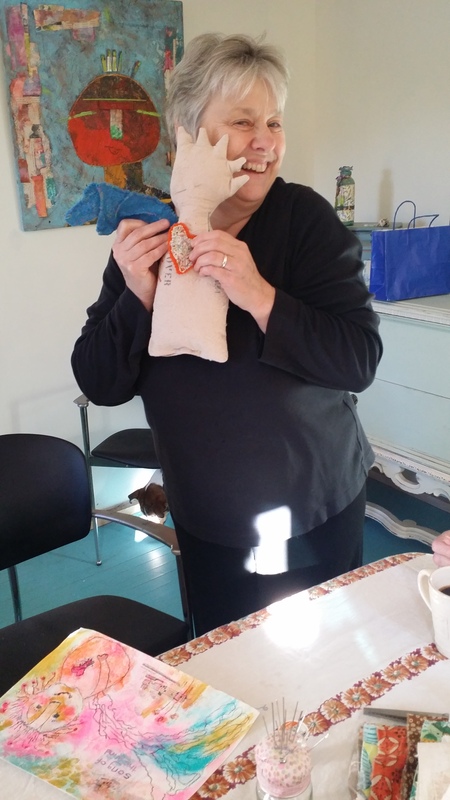 THANK YOU, NANCY!!!! I hope you like what I did with the flowers. I love them. 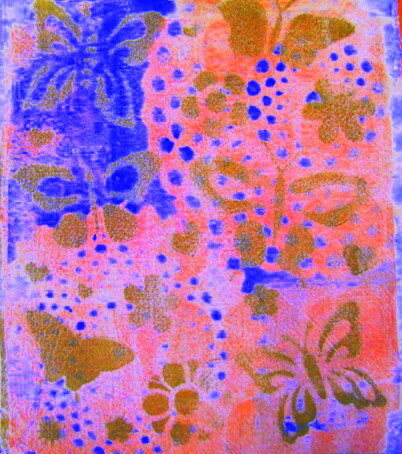 Now, here is what else I did with the Dylusion Spray Inks. They are NOT made for fabric, but I wanted to give it a try anyway. As long as you don’t get it wet, you’re fine. It’s really made for paper. 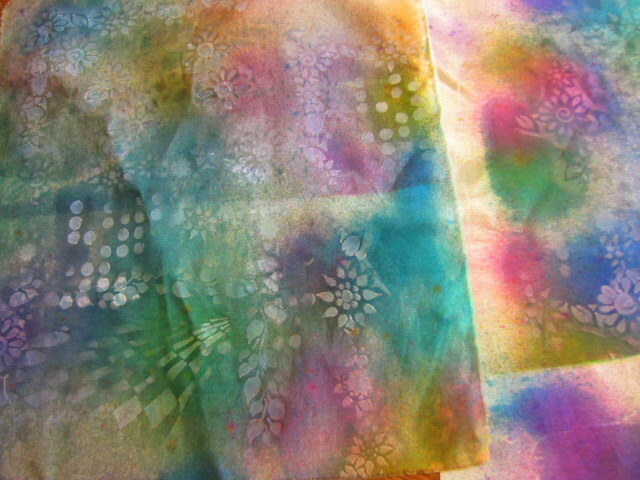 I grabbed some muslin fabric and started spraying different colors all over. Oh my.. so purdy. 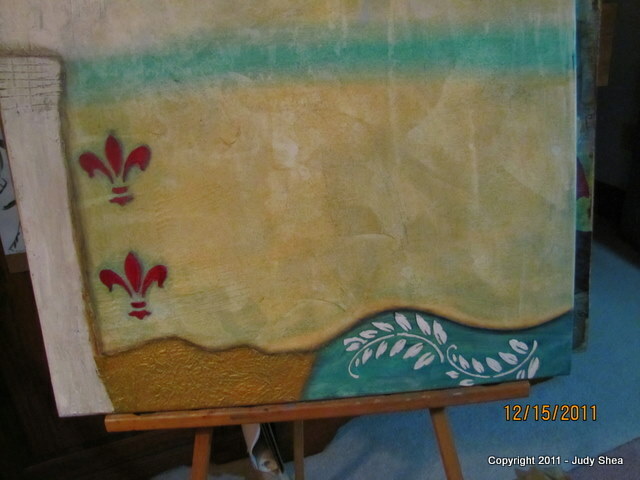 Then I took a little of the Tulip paint (made for fabric) and mixed that with a little gesso. 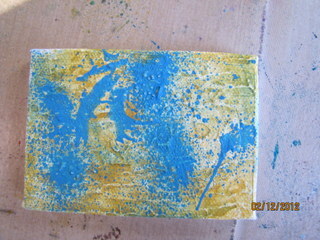 Took my make up sponge and dabbed it in the paint and gently pounced it on the fabric through a stencil. 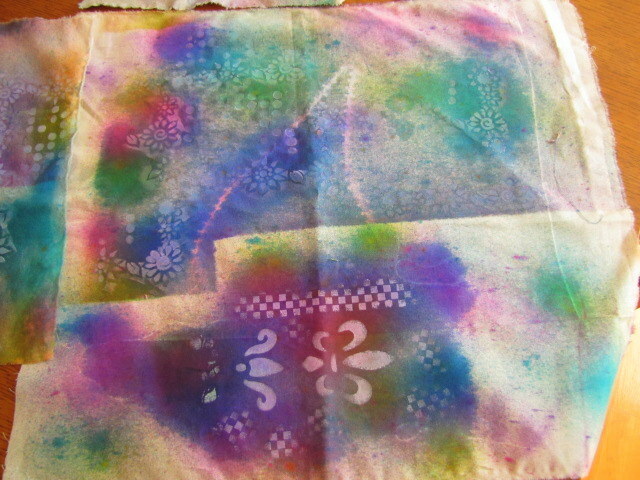 Because the ink is not permanent on fabric the white paint was a little tinted. But, I still liked it. What do you think?? I’m just loving these colors. Now if they can take these inks and make them for fabric. Above: I spray through a rubber sink mat. Found it at Wal-mart. Check out Dyan Reaveley”s YouTube videos HERE. Watch her create. You can also check out her blog HERE. She’s a hoot. 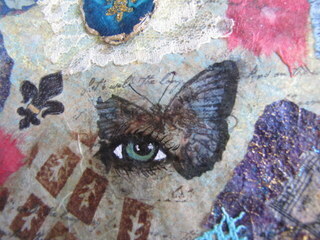 I’ve had a few requests to show how I do some of my mixed media art. Ask and you shall receive. I filmed this about two weeks ago. Then I had troubles with downloading/uploading, which software to use… yada yada yada. Here is my first edited (poorly) video. 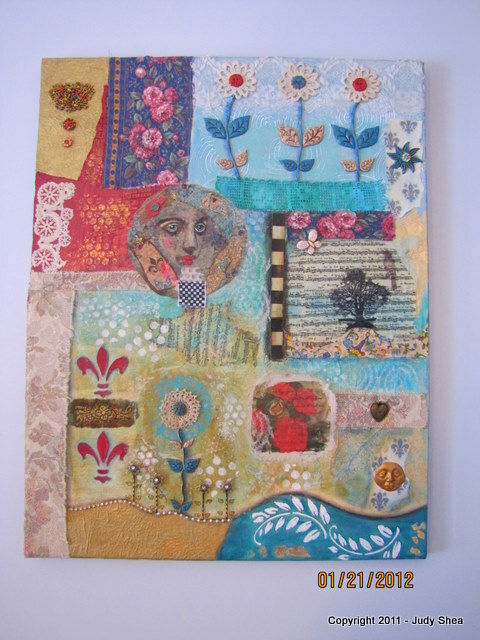 I decided to make a coffee filter collage piece to show you my process from start to finish. No planning was done.. I just took out a stash of my “stuff” and see where it took me. I don’t need to write much more here on the blog, as the video will give you all you need. 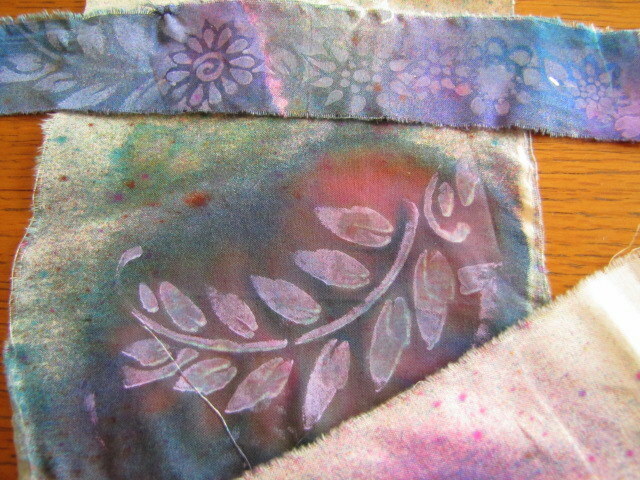 I used this same process using used dryer sheets or on a piece of fabric (I like muslin). I hope you enjoy… and I apologize ahead of time for any hiccups in the editing (in addition to a whining dog, no not my husband.. ha ha). I’m just getting the hang of this. I think little parts got cut out when I did the editing. I can see that now. 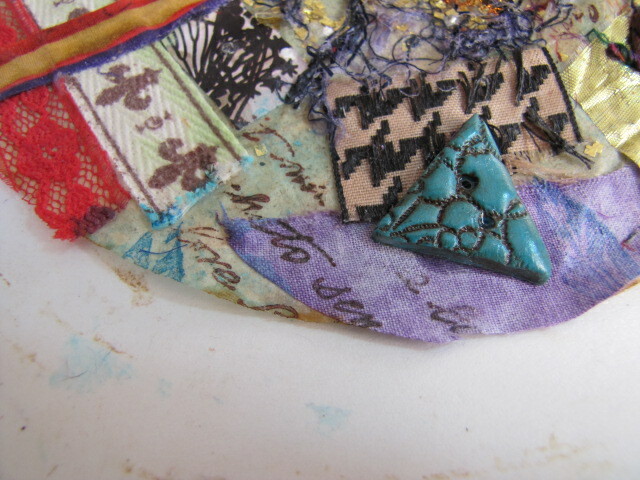 But you get the idea here on adding layers and fun ephemera. It’s 18 minutes long… so sit back and relax. Silence all cell phones, as they say in the movie theaters. Here are some closer still shots of the final piece. 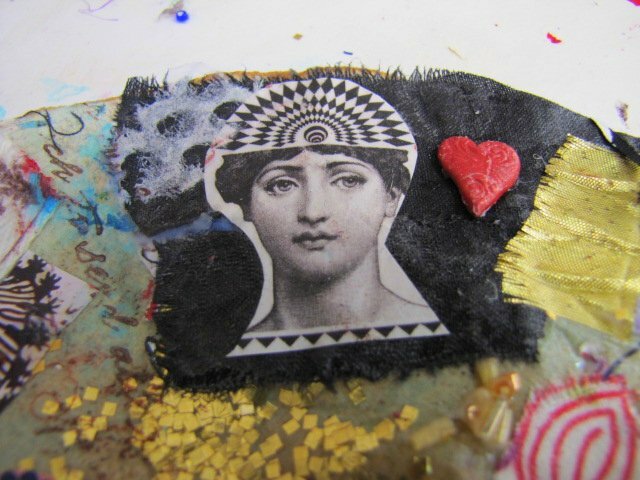 So many uses… cut up your favorites parts and add to your journals and collages. Imagine this as a unique book cover with sewn pages. 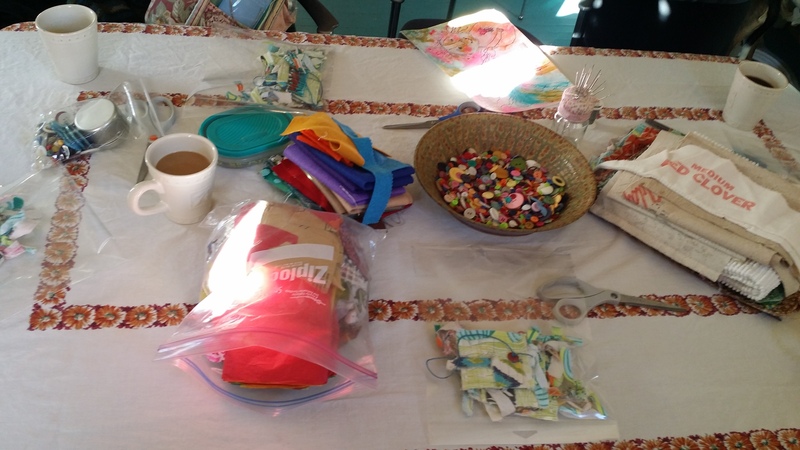 Sew it on a canvas bag or add it to a quilt project. 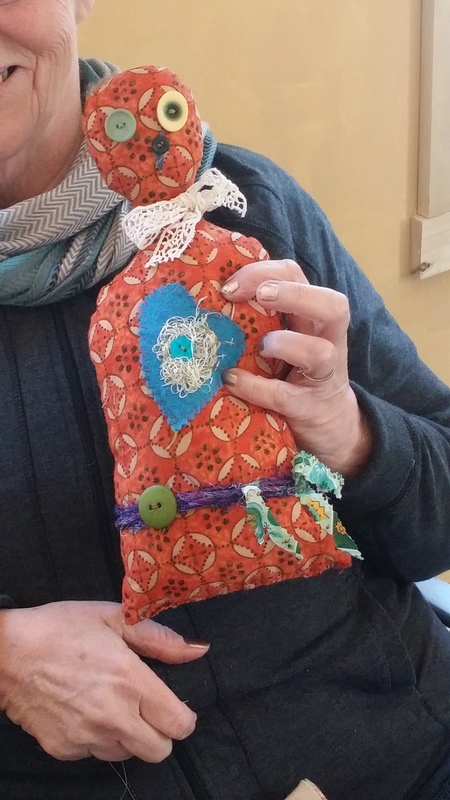 It’s a pretty strong piece by the time you’re done with the layers of fabric, etc. and gel medium. 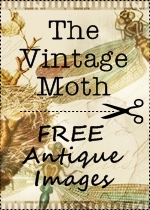 Click here to see another collage filter I made. Here is a reminder of what you can do with the full circle filter: See how I talk about putting this one together HERE. Thanks for stopping by and for all your compliments, kind comments and some of you who asked for a video on how it put my art together. Send this along to a friend who might enjoy it. Please give this a try.. So easy.. I want to see yours. Send me pictures and I’ll put them on my blog. Love having fun with you. More to come. Ok.. where did we leave off? Oh yes.. computer drama. Don’t remind me. Let’s just get to arting around. 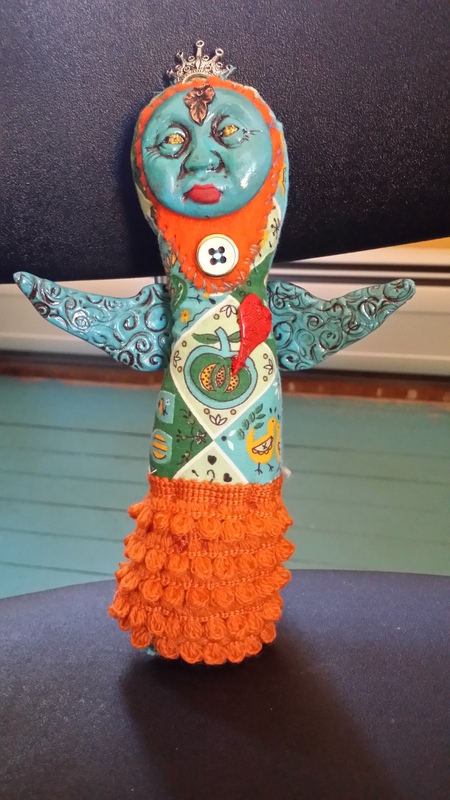 I”m getting in the studio as much as I can.. sneaking in here and there. 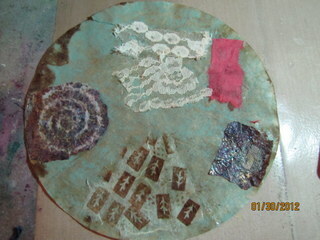 Today, I want to take you down the road of making used coffee filter collage papers. You’ve heard me mention them before in this post. I am a coffee drinker.. every day…so I started to save the filters. Once they had time to absorb the used coffee grinds, they are stained beautifully. If you aren’t a coffee drinker, go buy yourself a cheap jar of instant coffee grounds and stain paper or even fabric which absorbs is like a sponge. You can also use tea or even beets (see post I did here). It starts with taking the filter with the coffee grinds still in in and laying it out on a plate, paper bag, plastic bag; you get the idea. 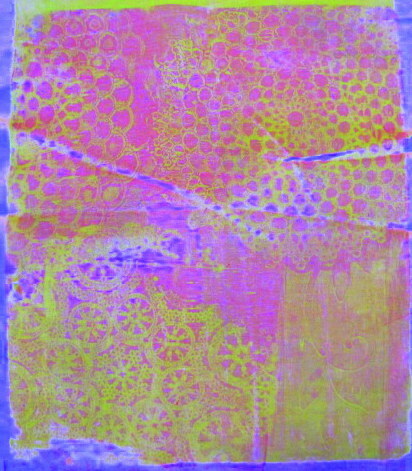 Let it dry – then wipe off the filters. The plate on the right is after I’ve wiped the grinds off the filter. 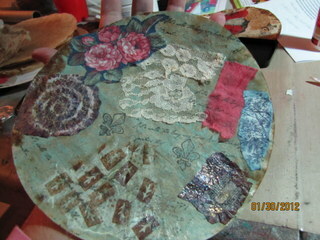 The paper plate I used gets all coffee stained too and that can be cut up and used in your collages also. 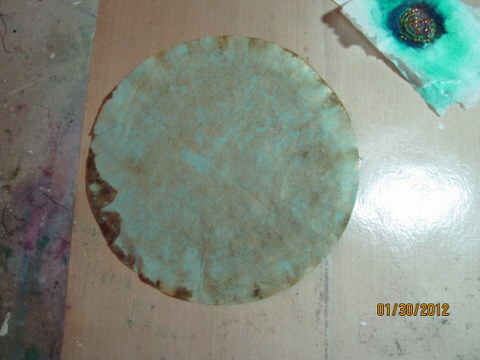 I took the filter and did a wash of teal acrylic paint and water. Let dry. I love the contrast of the paint and the natural coffee stains. 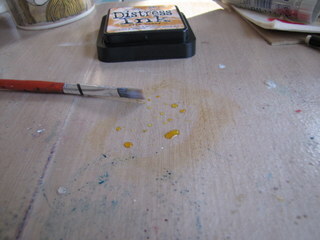 I spread gel medium on one side, let dry then the other to make the filter a bit stronger. 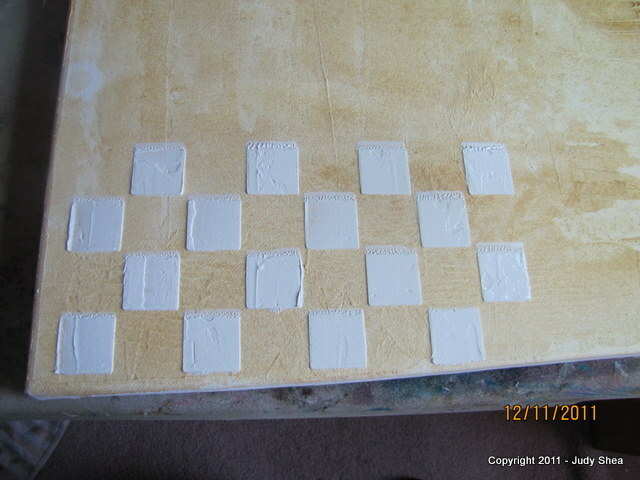 Then I used “YES” glue to adhere my pieces. It’s not bad to work with; I wanted to give it a try. A little stiffer to spread. So, I’m just taking whatever I have in my studio and start gluing to my filter. 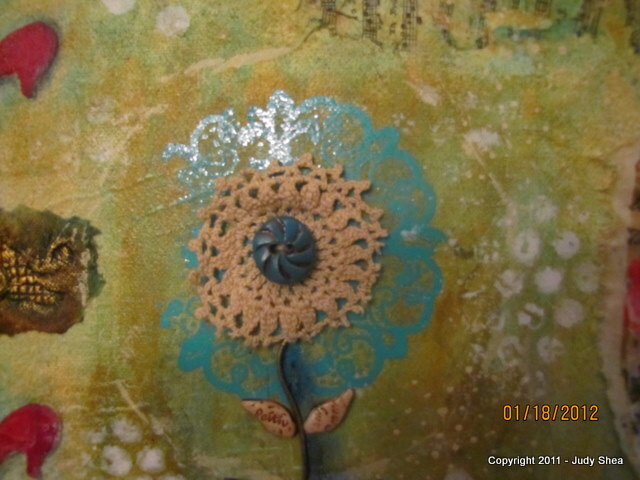 This piece below is a coffee filter that I painted and glittered with many layers.. so I”m going to rip that up and use it. 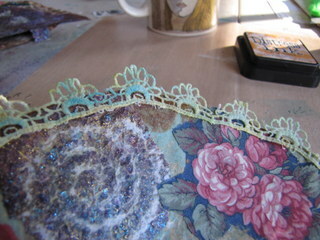 I just love my lace paper with the spiral. Yum. 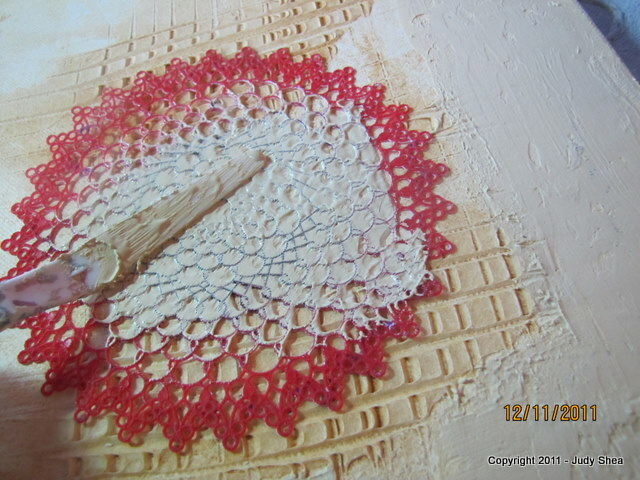 Below, adding lace and tissue papers. 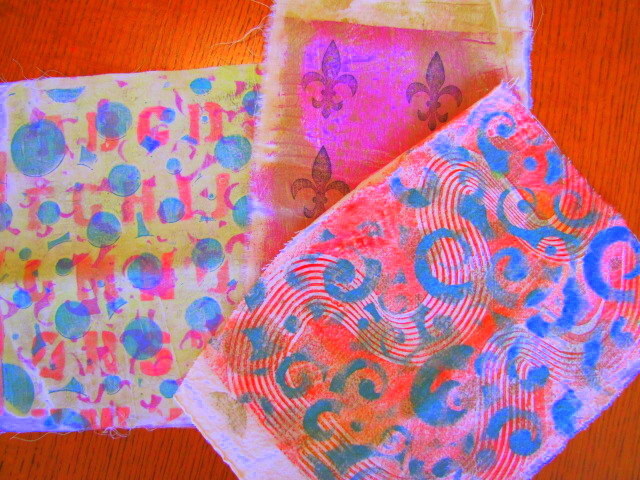 The tissue paper on the bottom was hand stamped with one of my tiny hand carved stamps.. so cute. 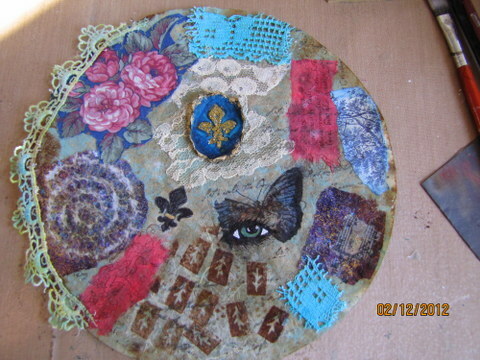 Adding fabric and painted doily. 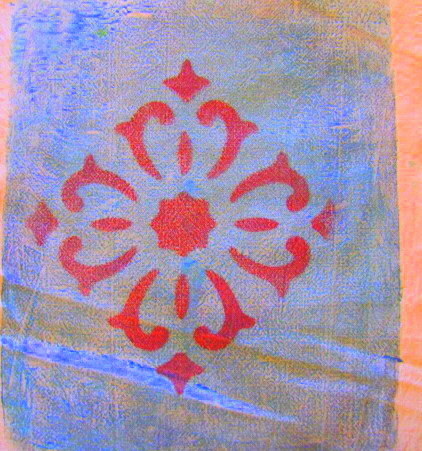 Now, after I added some lace to the edge of the filter, I wanted to stain it.. so I used Distress Ink – Wild Honey. 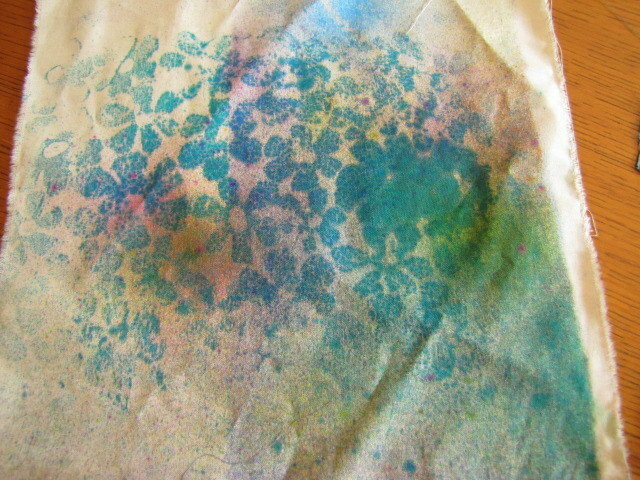 I took the ink pad and rubbed it on my craft sheet (or you could use palette or freezer paper (shiny side) and spritz some water on it to create an ink liquid. 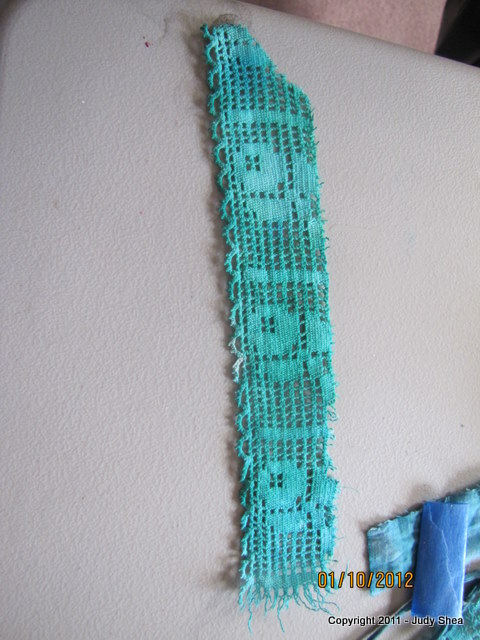 Then I just brushed it on the lace. 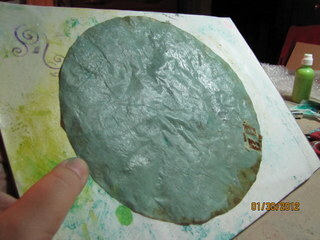 I dabbed a little of teal paint on it too.. cuz you know I’m a “teal” freak. 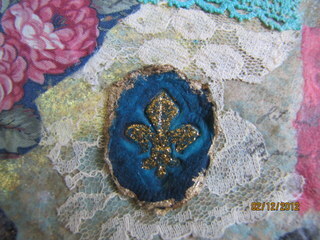 This fleur de lis was done with tissue casting. Like paper casting, but I do it with tissues. I’ve never tried the actual paper casting where they shred papers in a blender with liquids and smoosh those fibers into molds. Little Miss Patience (me), has no time for that. 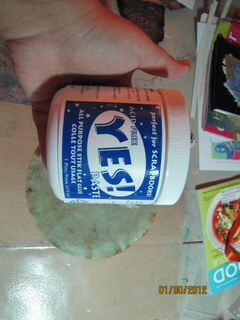 I found this site on paper casting with tissue paper and glue just to give you an idea of what I’m talking about.. 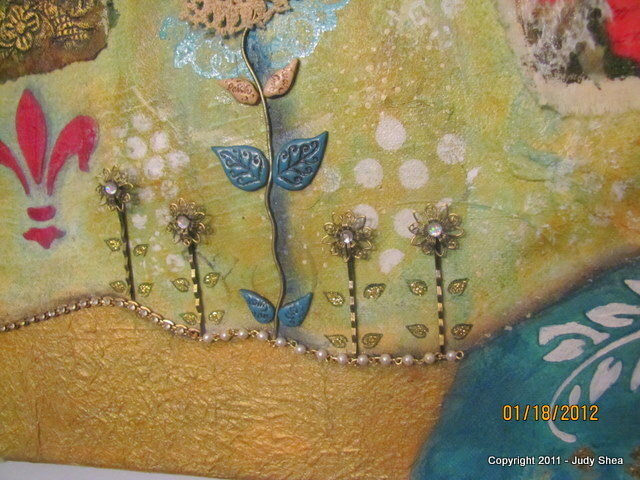 In the method I use, it’s layers of tissue (the kind you blow your nose with) and gel medium on a rubber stamp.. then I stained with inks, filled the image with glitter glue and dipped the edges in a little pool of Krylon Gold Leaf. I tried to do a butterfly image transfer onto the filter, but it did not come out all the way.. so I drew an eye in the section that was empty. I quite like it. 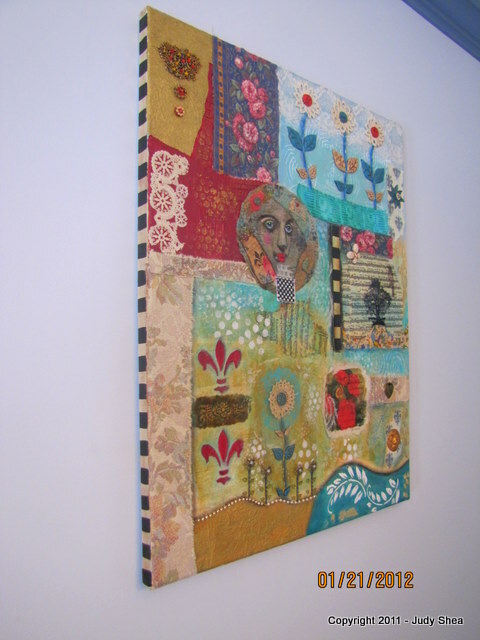 Wait.. I’m not done… So, I had this little canvas, 2 1/2 x 3 1/2″, just hanging around. I decided to paint/collage it and give it away. I started by making my own spray paints using acrylic paints and water.. Sprayed the canvas using all the colors in different places and letting some colors drip. 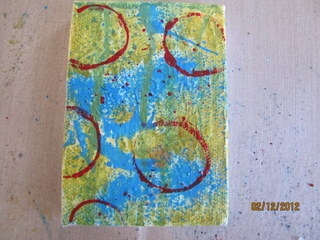 I dipped a cap into red acrylic paint and stamped that on the canvas. 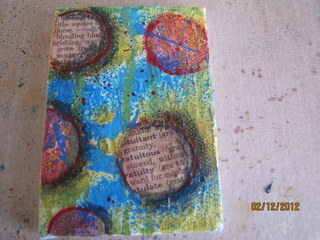 Cut out some old dictionary pages into circles. Used oil pastels for shading around the circles. 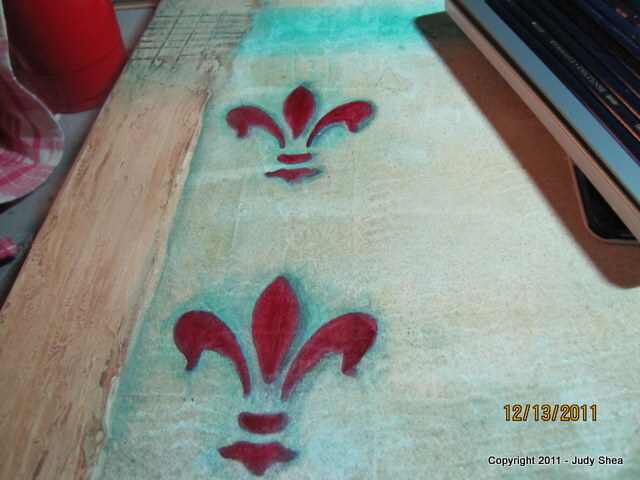 Added my stripe border and stained it. YOU WANT IT??? Leave a comment and tell a friend. I’ll draw a winner by next weekend (US only please.. sorry). Well, as you can see, I couldn’t contain myself this week; especially since I was gone for two. Hope you enjoyed the ride. .. and as always THANK YOU for stopping by and checking things out. You’re probably wondering, where the beejeezus is Judy. She never writes, calls or sends flowers. Sorry, I’m here.. been a long stretch, but I have updates. 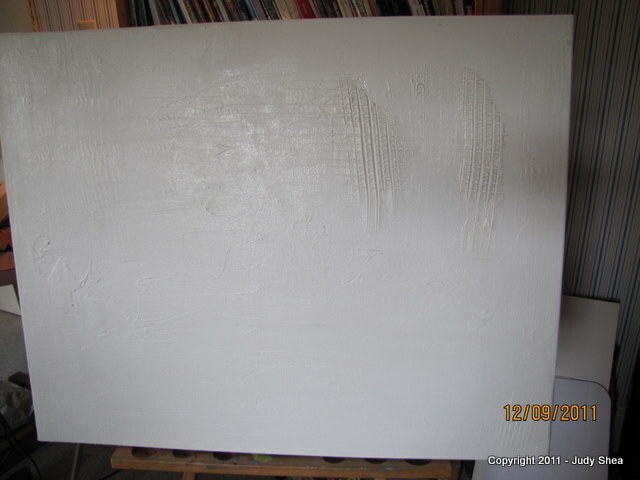 So, last time, I left you with the latest canvas I started. Click HERE to remember. 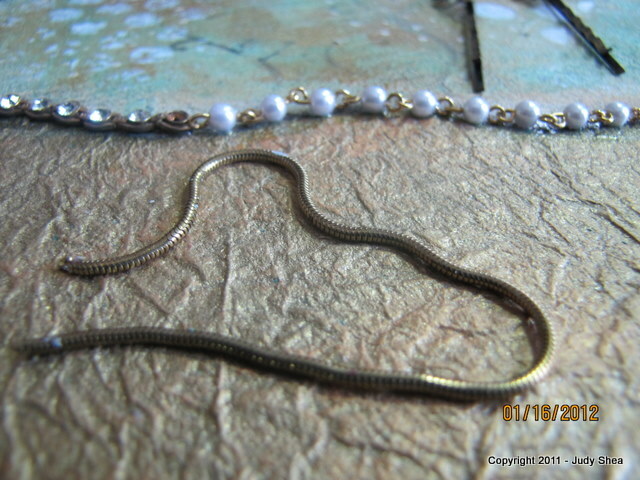 I took more still shots of my work, but not every single step in my progress. I got so caught up in the fun creative process. 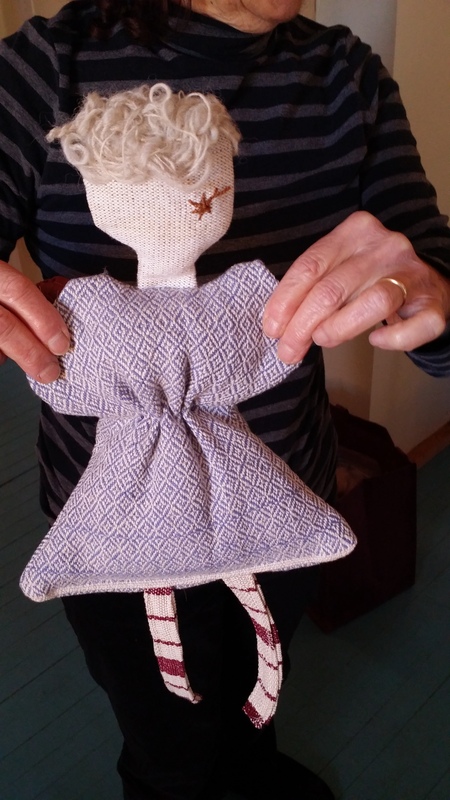 But, I have a surprise for you at the end of this blog. So, here is the progress about 3/4 the way through. 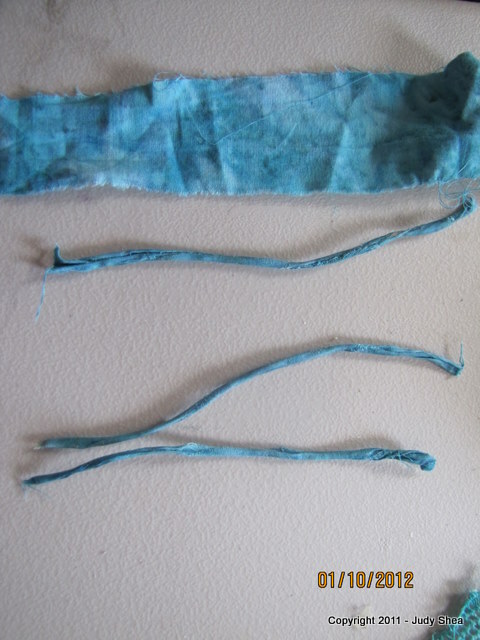 I made some flower stems from fabric that I loaded up with gel medium and let them dry. 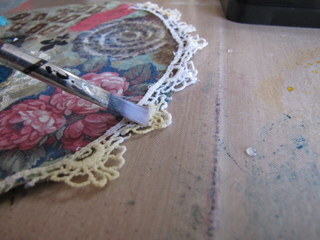 Then ripped a lace-like tablecloth in a strip and diluted it with paint for the “grass” for the flowers. You’ll see in a minute. 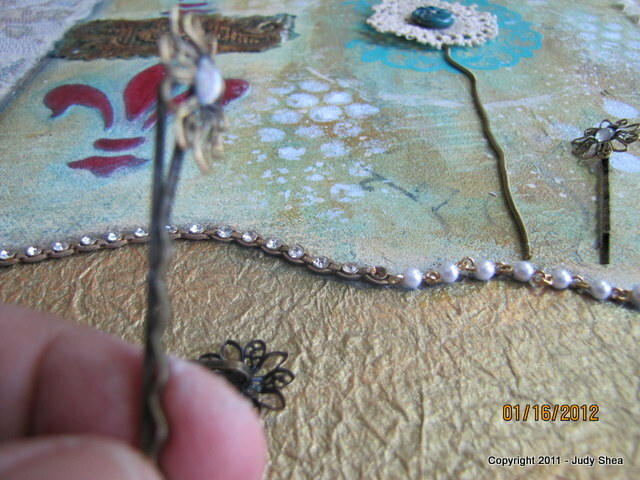 I forgot to mention that I cut a necklace chain for the stem of the bottom flower. Bracelets for the ground of smaller flowers that were actually bobby pins. 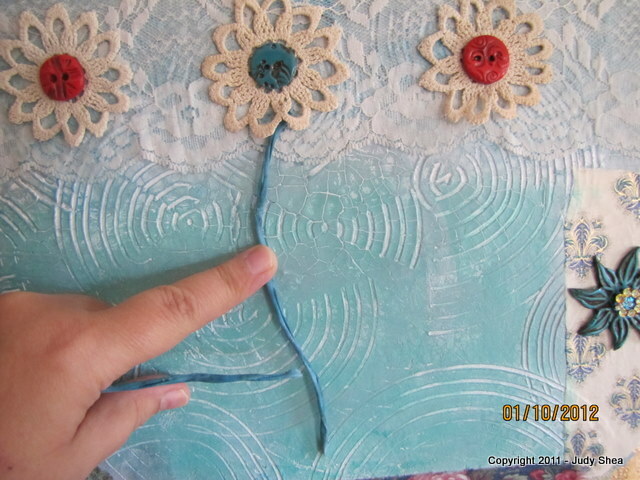 Then I made my polymer clay leaves for the flowers. 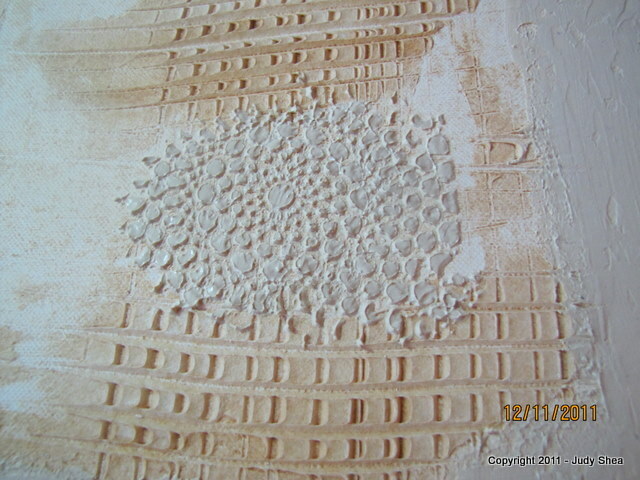 I must say, stamping into clay is so fun. 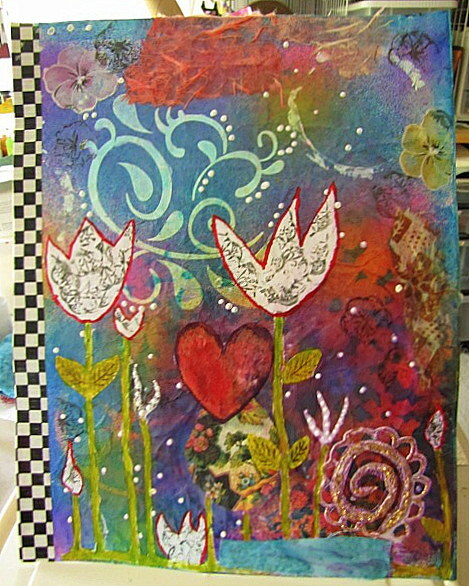 In the center flower at the top of the canvas, I also stamped text into the leaves. I am loving that look. 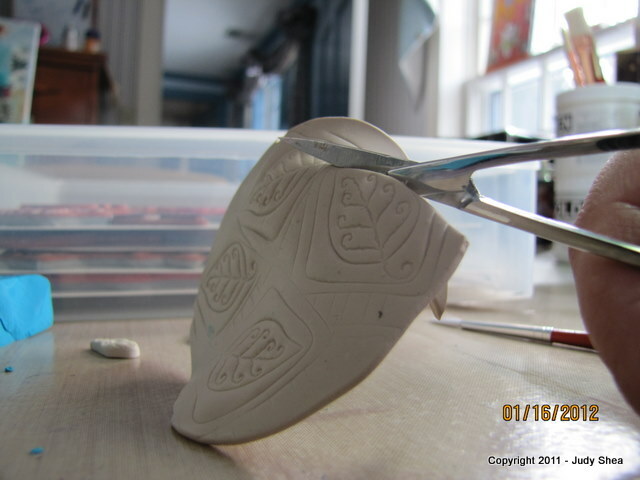 I may take a small portion of a larger rubber stamp and if I don’t particularly like the stamp anymore, I’ll cut the section off that I like. 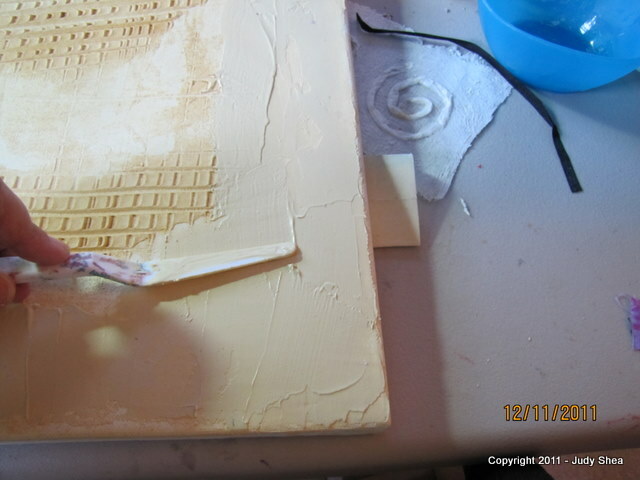 A small detailed scissors is great to cutting around a clay stamped image. 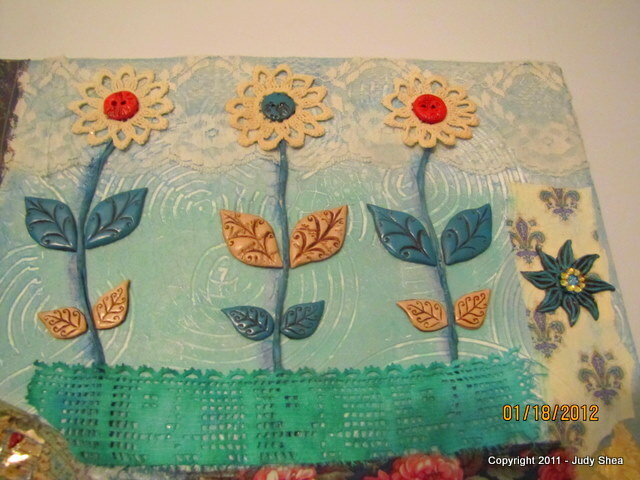 To see my tutorial on how I make my “Buttons ‘n bellishments, GO HERE. 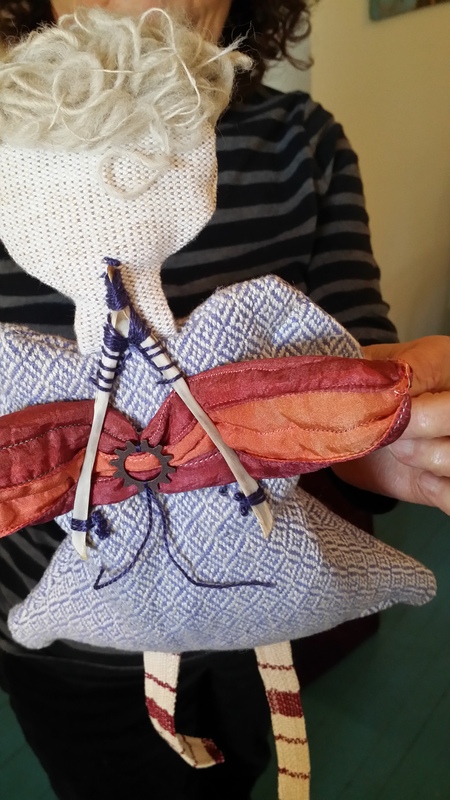 This shows you the button process, but can be used the same for embellishments. Here are some final pictures, but at the end, I’ll take you through the process with a surprise. 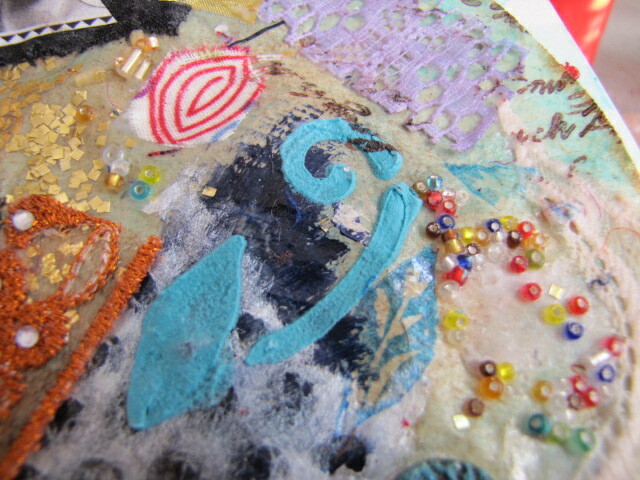 .. and finally, what I have been working on all day… a short video of me going through my canvas. A few corrections on words I noticed I should have fixed, but I had already done the video once before, so I kept it in. It’s just me talkin it up with you. I hope you enjoy and would love some comments. MixedMediaCanvas by Judy Shea 12112 from Judy Shea on Vimeo. 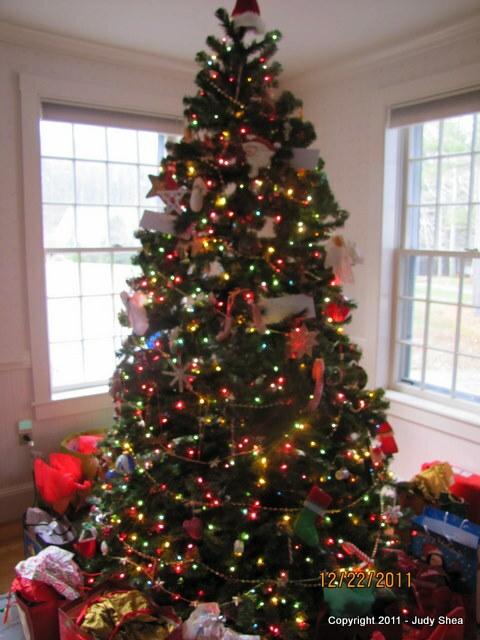 As always, thank you for stopping by and sharing this blog adventure with me. 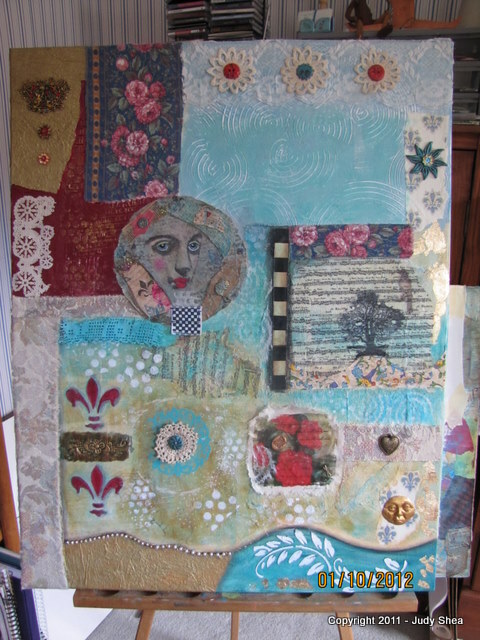 I took on a challenge to start of large canvas measuring 24″ x 30″. 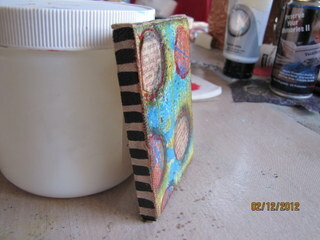 Not as easy as gluing, painting and collaging things on it like my other smaller works. There are bigger spaces and I do the blank stare. You know the look I”m talking about? What the hell am I going to put in that big space? Well, let me show you how it started and where I am with it now. 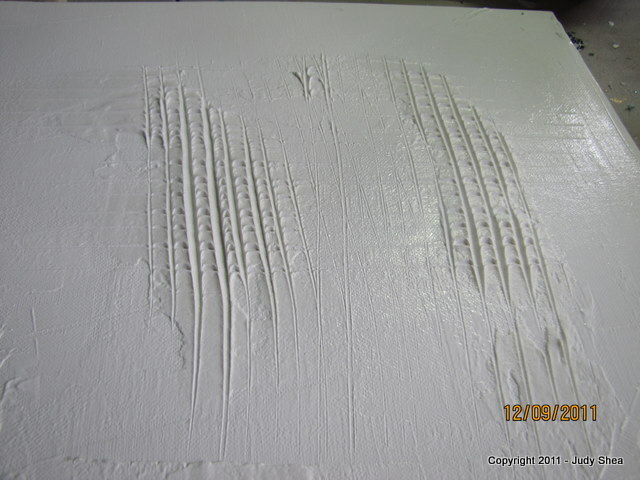 I gessoed the canvas then put on molding paste to get some texture on the surface. 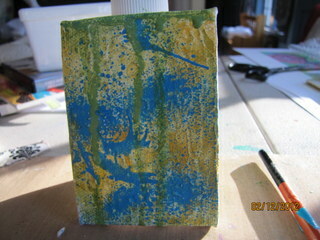 I put a wash of quinacridone nickel azo gold paint then added Cobalt Teal in certain areas using Golden Fluid Acrylics. So far so good, right? 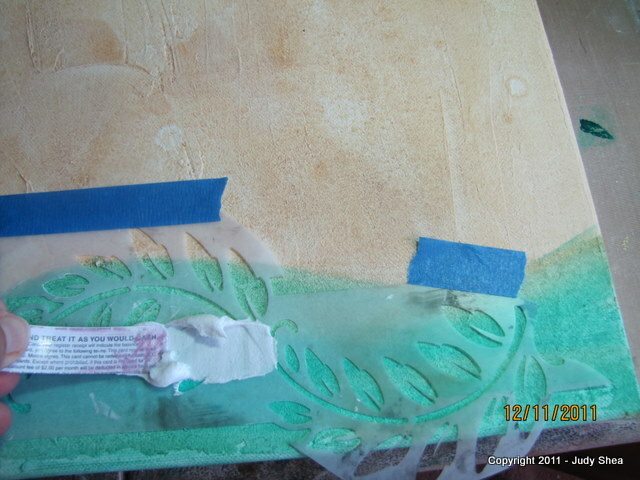 Then I added some more texture with molding paste, stencils, doilies. 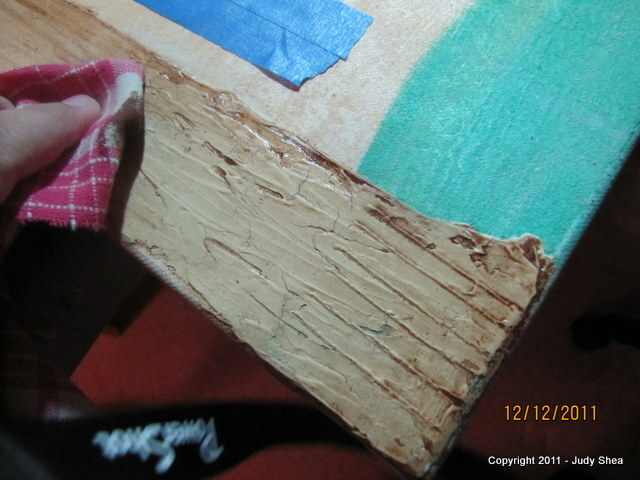 Then I added “Wood Icing” texture. 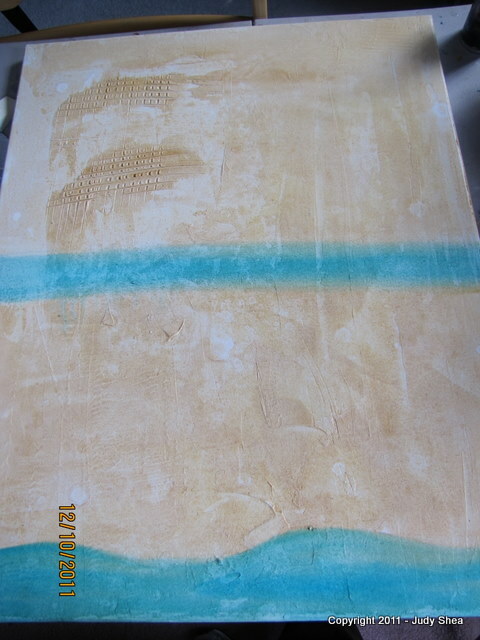 Here’s what the canvas looked like after the texture pastes. 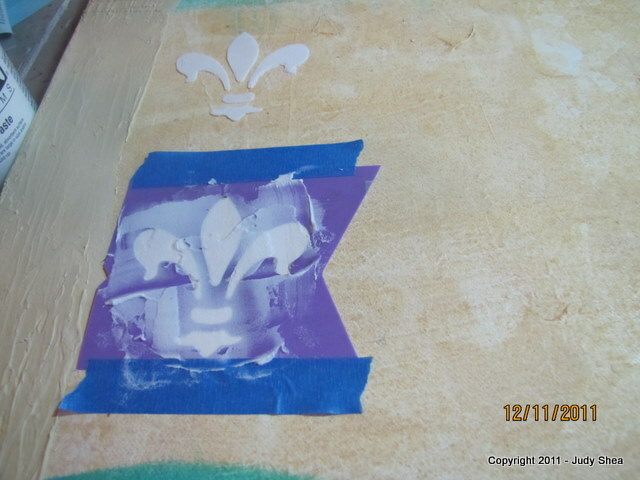 Ok.. then I added two fleur di lis with molding paste, stained the wood icing and then I went on to painting the checkerboard and the fleur de lis… Some parts I’m loving.. some.. eh.. not so much.. 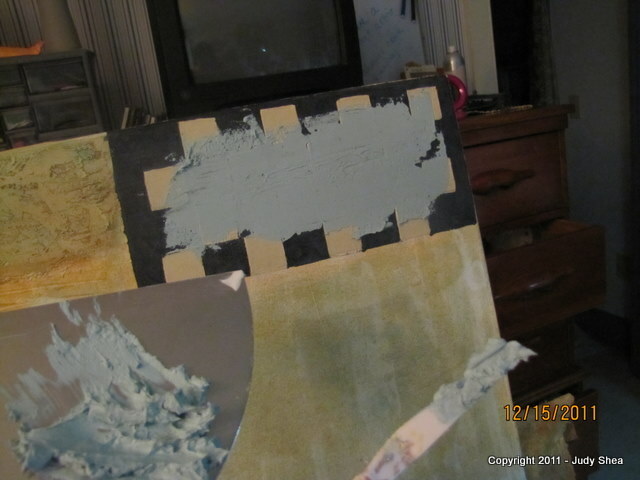 I am not liking the checkerboard… too overpowering.. so I”m going over it with a blue crackle paste. I know, I know.. don’t worry.. it’ll be ok. 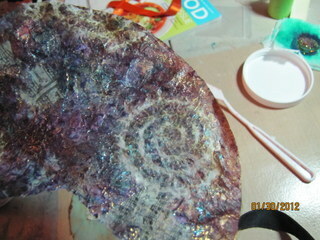 While the crackle paste was still wet, I ran a metal comb around in a cirle to give a spiral effect. Cool. 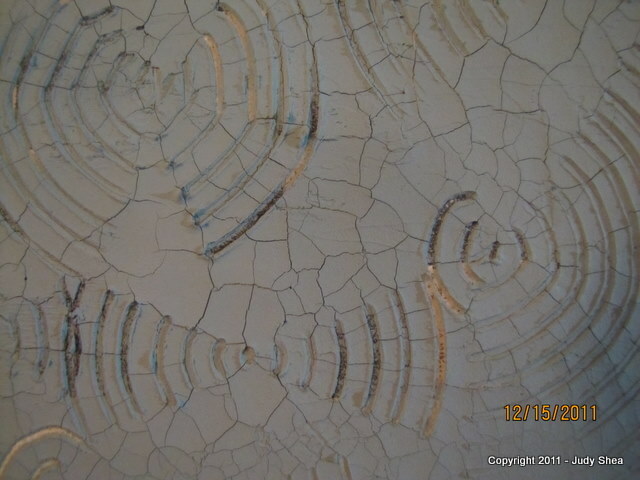 Here’s what the crackle paste looked like after it dried. Love it. 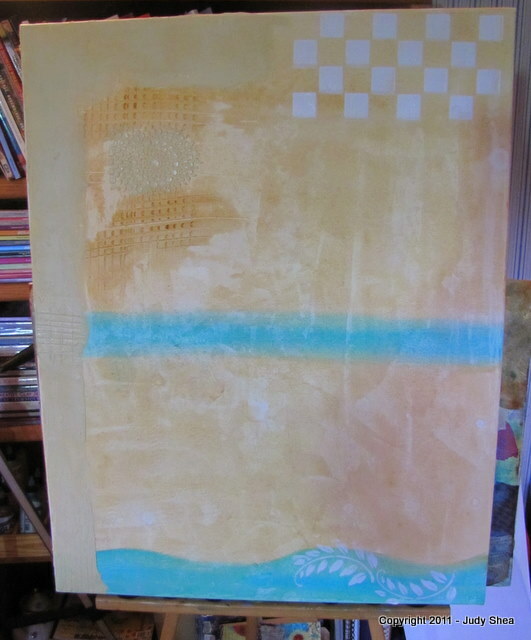 Next up was to add some fabric to the canvas. 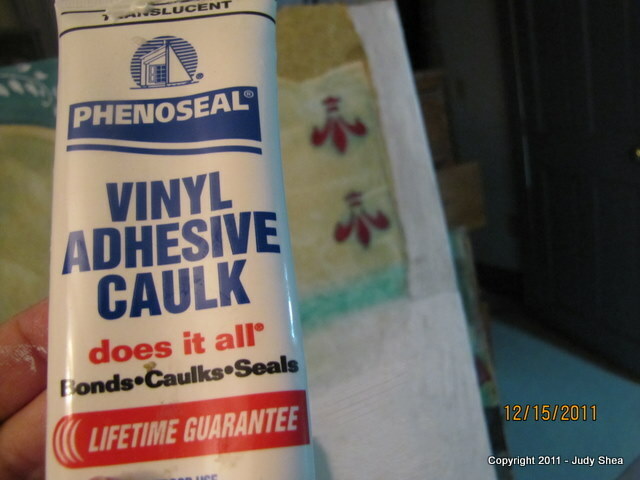 I used a caulking I bought at a dollar store a few years ago. Works great.. strong bond. 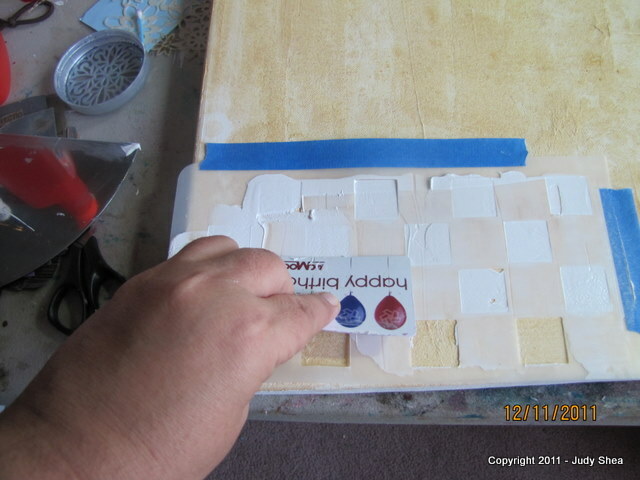 I don’t stay with necessarily one product for adhesives. 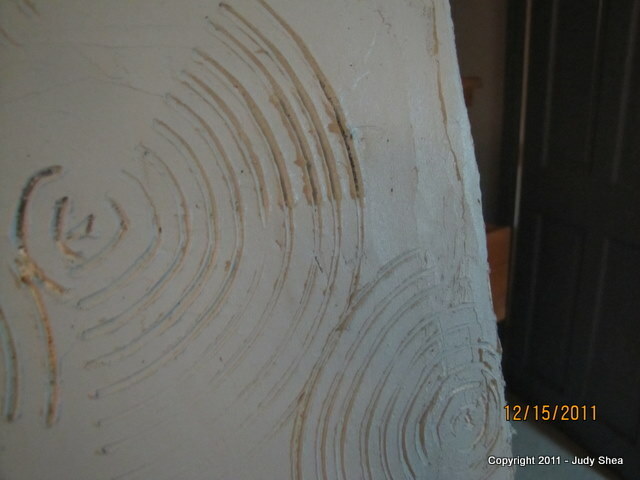 I use gel medium, caulking and one of my favorites, “Weldbond“. Let me stop here and tell you how much I changed on this canvas. I got so engrossed into it that I didn’t take some pictures. 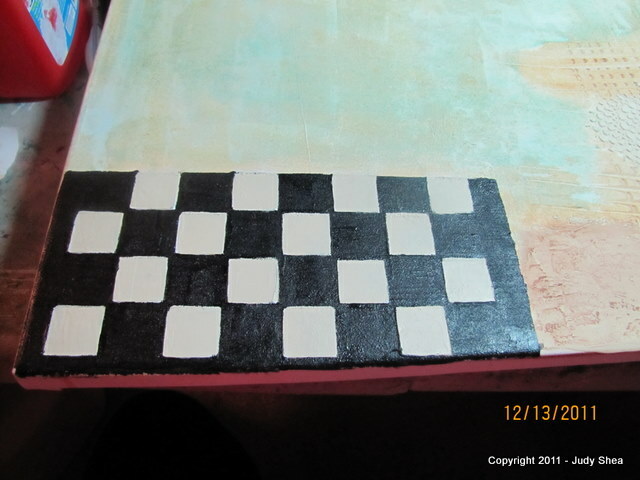 BUT… after I covered the checkerboard, I painted over the doily texture, then I put gold leaf on it.. then I put fabric over that. 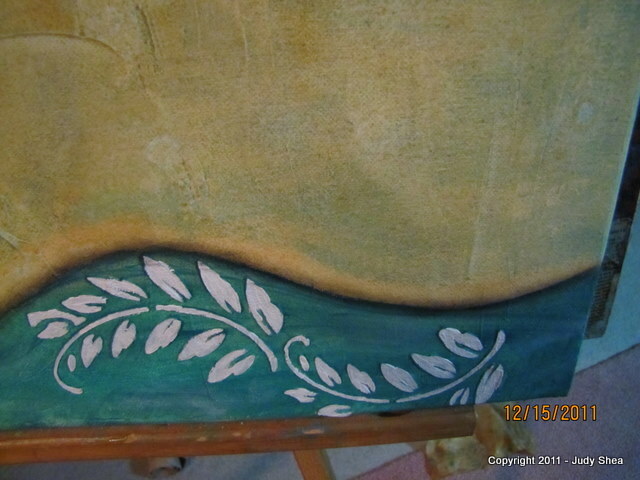 Next, I painted over the wood icing, then I put fabric upholstery over the bottom half of that. I just was not liking where everything was falling. I have a larger space towards the bottom that I’m not sure how that will flow. So, here is the rest of the pix I took and then the last one is where is stands now. 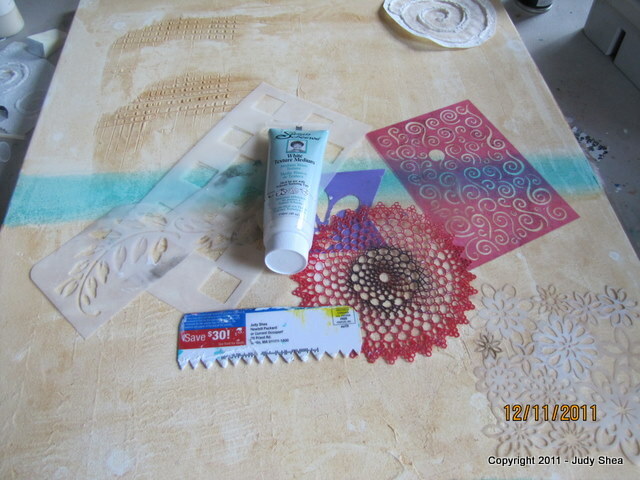 Below, you can see I added more fabric and one of my coffee filter art pieces, and modeling cream by Viva Decor. 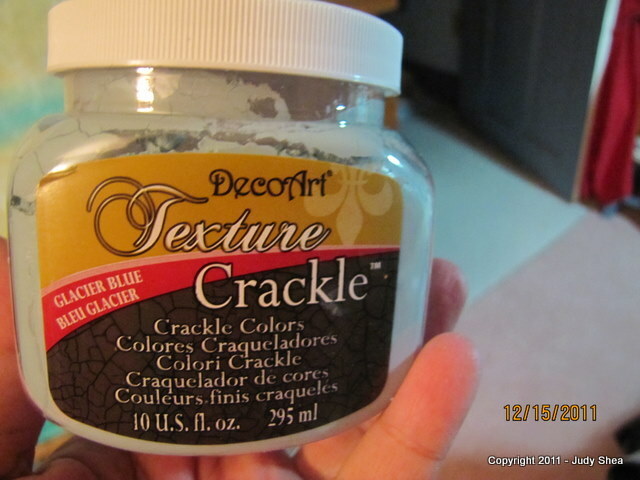 I pushed white acrylic paint into the crackle paste section then wiped it off. The white sank into the cracks. You can see the fabric to the bottom left and the roses on top. 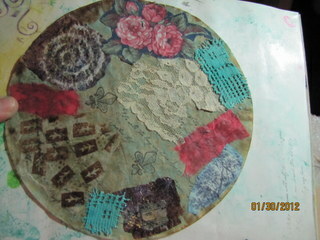 Also in that area, I added an old paper doily piece that was ripped. 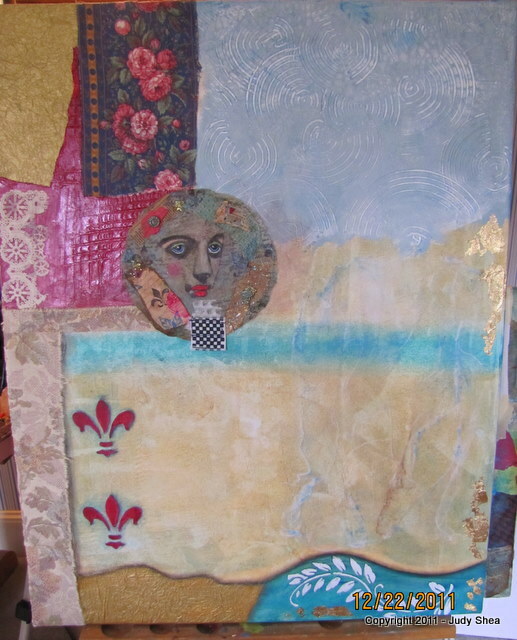 I also added cheese cloth to the large space on the bottom right and gold leaf. See..this is what I mean.. bigger is not better, it’s a bit intimidating. But, I am convinced that I will finish this and once I do, I’ll feel confident to tackle another one. See what I mean about all the open space…. dun dun dun…. (insert scream here). My plan is to get this done while I am on vacation from work. 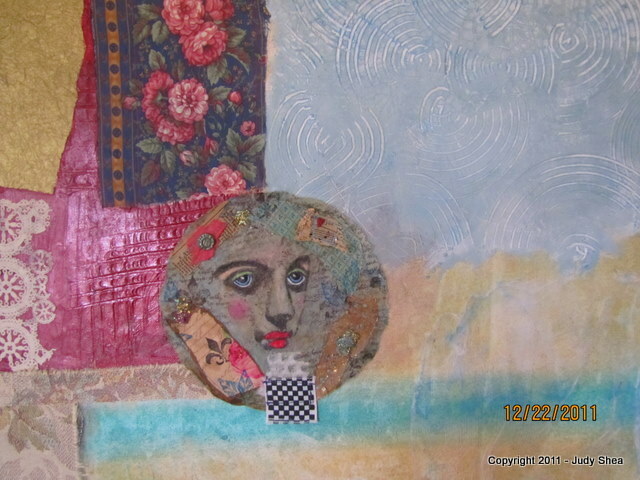 I still have so much to do to it…collage papers, polymer clay…. I can’t wait to find out what I’ll do next. I’ll blog my final pictures. Thanks for subscribing and stopping by.